Chocolate Gold Coins: Make Chores and More a Bit More Fun! Helping out around the house is something that many kids take to when they’re very young, but begin to dread soon enough. I have yet to meet a child who loves taking out the garbage, cleaning up their room, clearing the dinner table, or sweeping the sidewalk. There are plenty of much more fun things to be doing, and kids are very driven by fun! But as much as part of our job as parents is ensuring that our kids are given enough time to play and relax, it is also our duty to make sure they know that chores are a part of life. The garbage doesn’t take itself out, and the dinner table doesn’t clear itself. But everything gets done much more quickly when everyone pitches in! And that’s precisely why offering a little extra incentive can make your life a lot easier. Don’t get me wrong – I don’t think we should teach kids that every little thing they do deserves a reward. They should learn that life comes with some boring, tedious, or difficult things that need doing, and the only true ‘payment’ we receive is that they get done. But if your kiddo goes above and beyond to get something done early, or does a really great job, it can also be fun for you both to give them something in return. Our suggestion? Gold chocolate coins! And more specifically, gold chocolate coins that they can use to ‘buy’ something they really want. When we get older, the things we want can shift pretty drastically from what we wanted when we were 8 or 9 years old. Back then, we wanted to stay up a little later, play with our toys a little longer, and have an extra scoop of ice cream for dessert, with extra hot fudge sauce for good measure. (OK, we still want that ice cream!) With hard-earned chocolate gold coins, you can give your children an opportunity to ‘buy’ these privileges, making chore time seem a little less like work. Perhaps making their bed will earn them one chocolate quarter, while taking the dog for a long walk is worth a chocolate half dollar. A report card full of A’s and B’s? A small handful of chocolate money is in order! They could also earn chocolate money they didn’t even know they were ‘working’ for, such as a surprise coin or two for helping a friend or behaving in church. In these instances, it’s not so much about making them think that every good deed comes with a payment, rather letting them know that you noticed they did the right thing. Now that most kids are home for summer break, they’ll have even more opportunities to help out around the house. And they’ll probably want to ‘buy’ even more things as well, such as an extra hour to play video games at night, or even an option to skip their least favorite chore for a few days. Or, they might have a hard time saving up because eating their ‘money’ is just too irresistible! Sunday is National Lollipop Day 2014! Once Independence Day has come and gone, there’s a bit of holiday lull for a while. On one hand, the advantage to this is that we get to save some money. Holidays have a habit of getting expensive, and it’s good to let the old bank account recover! But on the other hand, it’s always nice to have a fun holiday to look forward to, and knowing the next one is in the distant future can be disheartening. And that is precisely why we think it’s so much fun to celebrate those much smaller holidays that no one ever heard of before the internet! Did you know there’s a National Bird Day, National Chip and Dip Day, Step in a Puddle and Splash Your Friends Day, and even a Reach as High as You Can Day? All these, and countless more, have been imagined up and posted all over the internet for all who may wish to celebrate them! With hundreds, if not thousands, of these fun holidays out there, it is somewhat impossible to do something special for them all. However, it is possible to choose a few favorites (I’m a big fan of Eat What You Want Day, personally), and celebrate them for all they’re worth. And one of those holidays we definitely think is worth honoring is coming up this Sunday – National Lollipop Day! Don’t worry; this won’t be an expensive holiday. You don’t need to buy a mountain of presents, or prepare a 6-course feast. All you need to do is grab a few suckers and sweeten up your weekend one lick at a time. Haven’t had a lollipop in a while and aren’t sure what’s out there? 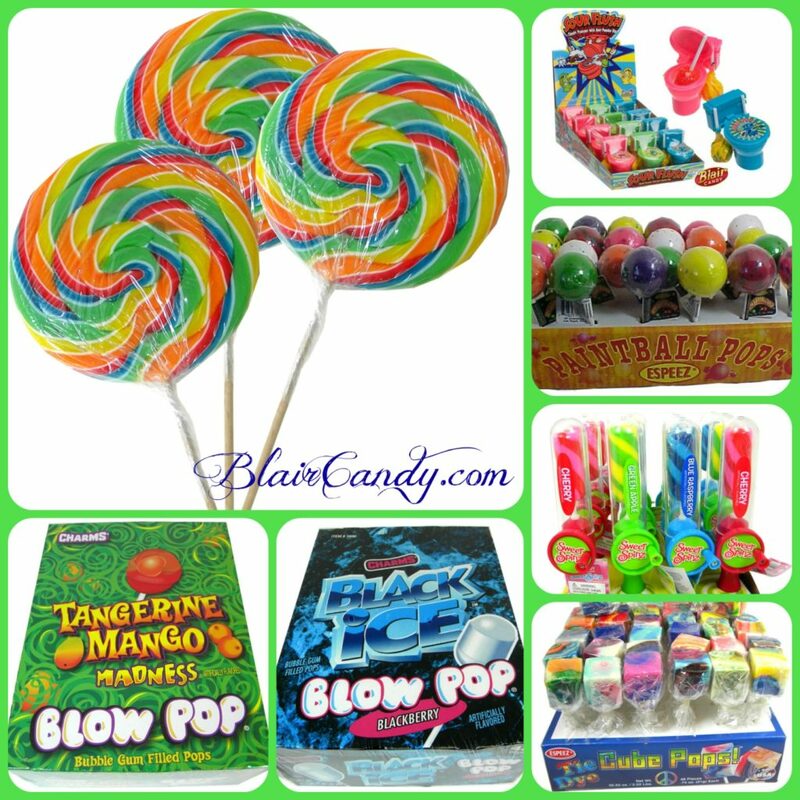 Browse our extensive selection of yummy lollipops and pick a few favorites!